Does your child have difficulty saying speech sounds? If so, your child may benefit from oral motor therapy / Oral Placement Therapy*. An articulation assessment examines which sounds your child has difficulty producing. An oral motor evaluation determines WHY your child has difficulty saying specific sounds. 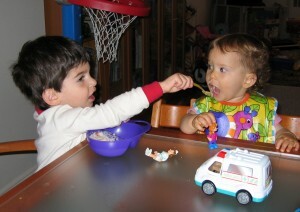 Oral motor therapy exercises can be completed while a child eats since the same muscles are used for speech and eating. Individualized oral motor exercises target developing awareness, strength, placement, coordination, and mobility of the jaw, lips, and tongue. Using an oral motor approach along with traditional articulation therapy (targeting individual speech sounds) typically increases a child’s speech clarity in conversation rather than simply at the word level. At first, a child may not have the oral motor strength to say a specific sound. Sometimes, it is best to strengthen the mouth muscles first, teach oral placement, and then address the individual sound. Oftentimes, children begin saying sounds correctly simply by helping them to feel where they should place their jaw, lips and tongue. Exercises to improve oral motor strength may include exercises to improve jaw strength and stability, lip rounding, and tongue retraction (especially for tongue thrusters). Oral motor exercises to be completed at mealtime may also be incorporated as we use the same muscles for eating and speech. For example, when drinking from an open cup, a child should use his lips to take a sip and not place his teeth on the cup. It is best to see dissociation – the jaw, lips, and tongue working independently. Oral motor therapy may help resolve issues with open mouth posture, drooling, thumbsucking, and pacifier use. Stephanie’s oral motor therapy program includes reviewing oral motor exercises with parents at the evaluation and at each oral motor therapy session. This way, the exercises can accurately be practiced for homework. Written detailed instructions are consistently provided. Parents are encouraged to call or email with questions about the homework in between sessions to maximize skills. *Oral Placement Therapy is an updated term for oral motor therapy, as it better indicates how a therapist teaches placement of the jaw, lips and tongue using tactile cues to shape speech sounds. The term oral motor therapy still formally refers to therapy for symptoms such as open mouth posture and drooling. At times these therapies may be used in combination. Stephanie formally began studying oral motor therapy through Talktools™ in 2001 and was selected to study under the supervision of Sara Rosenfeld-Johnson, an innovative leader in oral motor therapy in 2006. She has continued to take Talktools™ courses through 2016. Stephanie has also taken oral motor classes with expert clinicians such as Pam Marshalla, Charlotte Boshart, Robyn Merkel-Walsh and Debra Beckman.